Daddio's Auto Parts offers great storage at an affordable price. 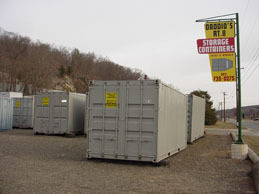 We sell and rent containers. Also we have a delivery and pick-up service. Our storage containers provide a clean, secure, water tight space. Store your cars, motorcycles, furniture, and much, much more. We have 20' x 8' x 8' O.D. and 40' x 8' x 8' containers.